As you walk through the doors of the Provo City Center Temple, time seems to ripple in on itself, moving you to a well-loved past even as it turns hearts to the future. Today, the smell of rich mahogany and walnut envelopes you immediately after opening the doors, as remnants of the temple’s history glimmer from unexpected corners. Many can remember a fire tragically gutted the iconic Provo Tabernacle to the ground on 17 December 2010. The Provo City Center Temple is a lot different from the Provo of 1883, but in some ways, they are much the same. The Provo City Center Temple is the 16th in Utah, the 4th in Utah County, and the 2nd in Provo City after the Provo Temple of 1972. 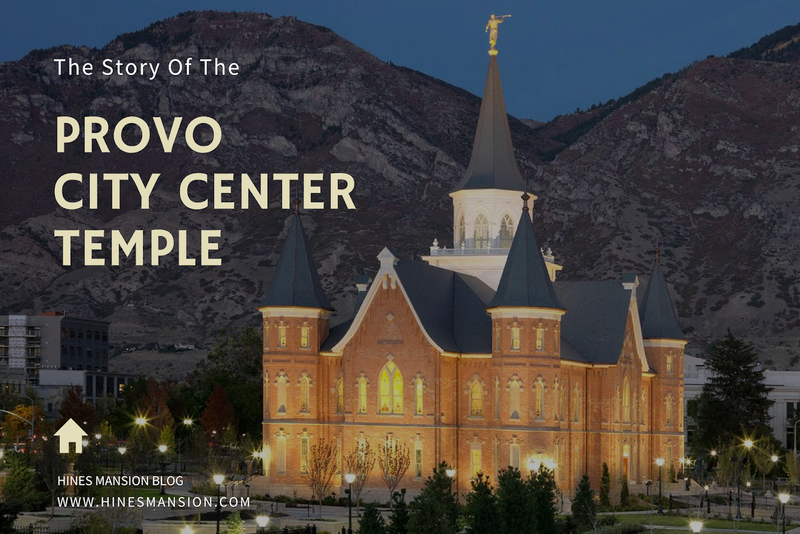 The Temple offers an extraordinary sense of connection to generations that passed through Provo since its first settlers from the British Isles and Western Europe. The Presbyterian Church and the Church of England had a significant influence on the Temple construction - mostly architectural designs of church buildings and meetinghouses. Latter-Day Saints have been gathering on these grounds to worship since the 1850s in the Meeting House, the Provo Tabernacle, and now the Provo City Center Temple. 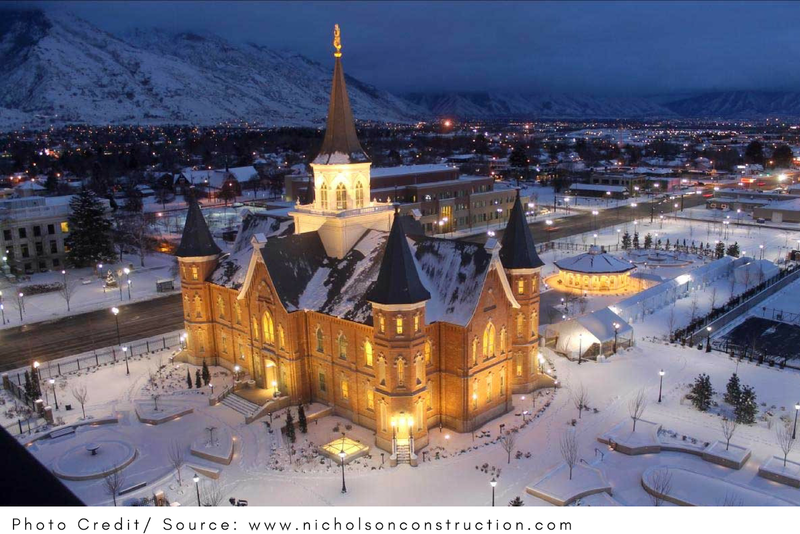 Since the tragic fire in 2010, the new fascinating Provo City Center Temple has risen from the ashes of the 1867 Provo Tabernacle. The new building construction and design themes pay homage to the Tabernacle’s legacy; the Temple offers visitors a glimpse of a time long passed. Provo in 1883, like today, was a hotbed of religious activities and recognized across the world as one of the best places to visit or live. 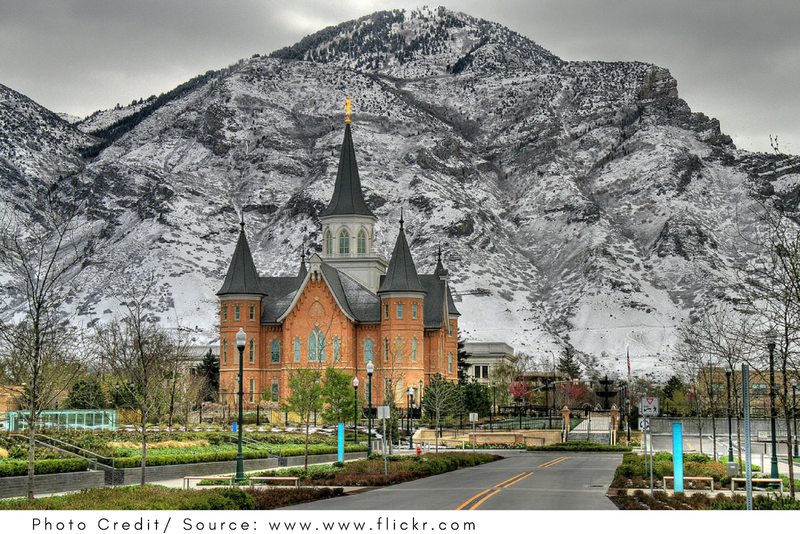 The Provo City Center Temple is a historical icon of Provo, hosting many religious and cultural events. Predating the current Temple was a small tabernacle, the “Old Provo Tabernacle” from 1861 and 1919. The plan for the Tabernacle dates back as early as 1852, although its construction started in 1856 and was situated north of the current Tabernacle structure facing Center Street. The old tabernacle construction was affected by the Walker War. At its completion, the original Tabernacle seated 1100 people, had a single tower located on the North end above the foyer that was 800 feet tall, housing the 500-pound bell. 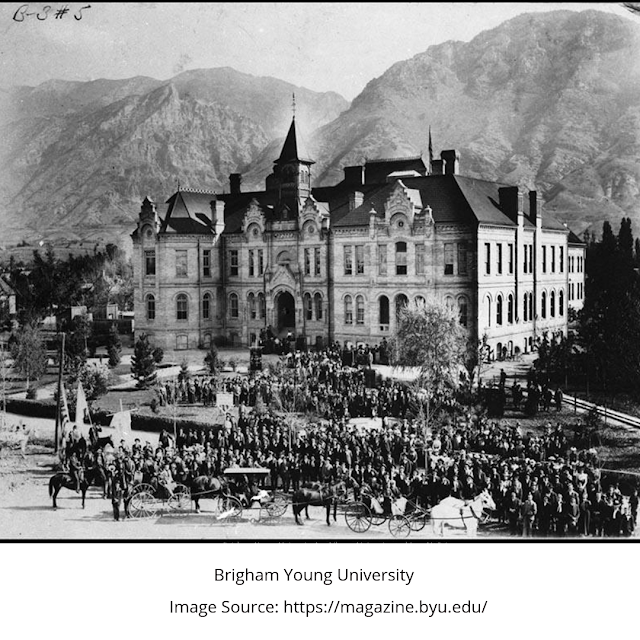 It was dedicated in 1867 by Brigham Young and served as the tabernacle of the LDS Church from 1898 to 2010. 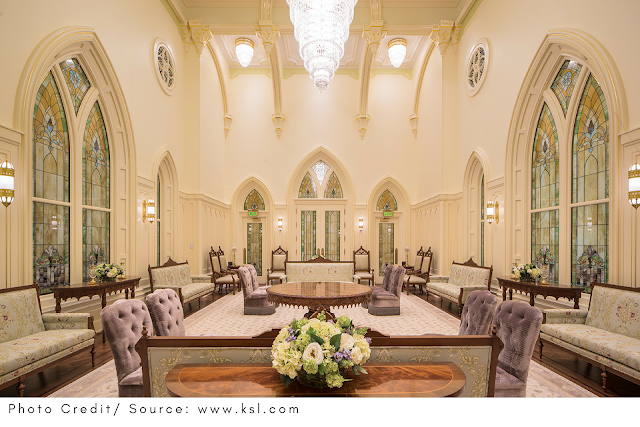 The outer walls were destroyed by fire, and the LDS Church well-preserved the remaining exterior and built a new groundwork and interior into the Provo City Center Temple, completed in 2016. After the tragic fire of December 2010, the LDS Church announced that the Provo Tabernacle would be rebuilt as the second temple in Provo City. The fast-track project included a complete restoration of the original exterior. The outer wall was placed on scaffolding for the excavation of the two basement levels beneath. The original brick for the 1880s building was salvaged, and custom oak and walnut millwork was done while pillars and walls were painted. The gothic-style archways and windows perfectly align with exterior windows and are a tribute to the original Tabernacle. Following a 5-year restoration, the more than a century-old icon served as a House of the Lord and was dedicated on 20 March 2016. Entering the Temple, itself, is a unique experience. 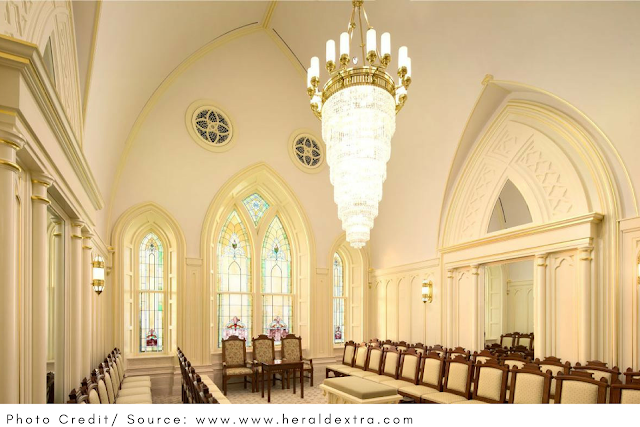 The intention of the Temple’s design is to preserve the historical integrity of the original Tabernacle as much as possible. The new construction expanded the Temple below the ground, consisting of 4 levels: two underground and two above. The levels broadened to about 12,00 square feet, but the upper underground level was expanded to 53,00 square feet, creating enough space for all of the essential Ordinance Rooms in the Temple. The restoration designers were tasked to capture what the Temple might have looked like in the 19th century if built at that time. Certain historical details were preserved to reflect the spirit and heritage of the Provo pioneers. The original African mahogany and walnut wood feature an extensive display including the wood floors, door frames, arches, molding, railings, and banisters. Utah sandstone matching the original pieces and rose granite from India were used to complete the baptistry. Large decorative hinge, door handle, and door plate designs date back to the 1800’s. 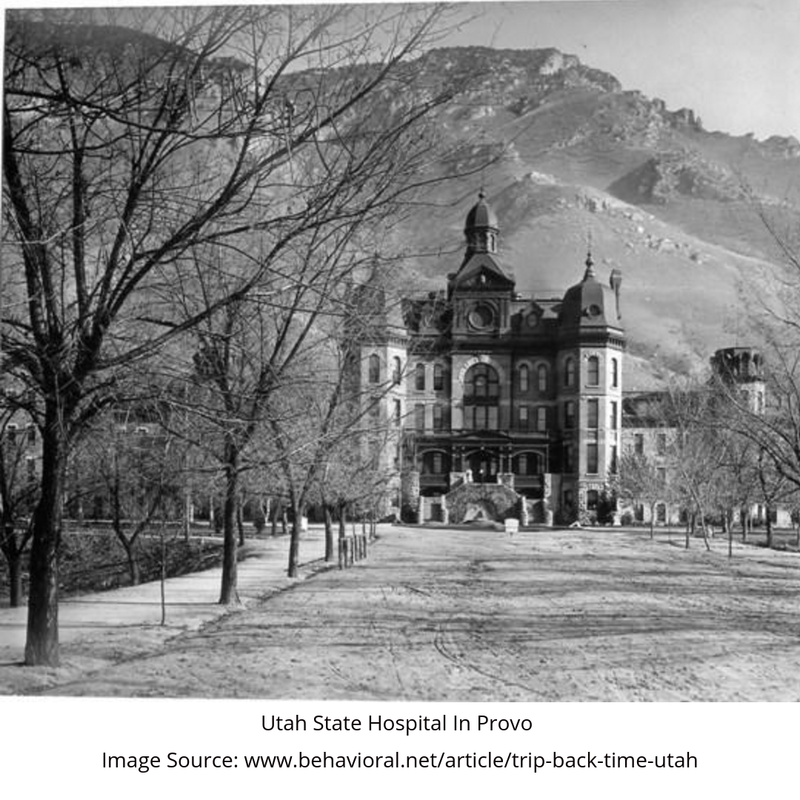 All four of the Provo Tabernacle’s spiral staircases in the turrets were retained and restored to their original design. More fascinating features of the old Tabernacle restored include the floral ribbon design in the Bride's Room, the bench-style seating in the Instruction Room, the pulpit in the Chapel, and the oxen holding the Baptismal Font. Nineteen unique pieces of art decorate the temple; Elspeth Young's "Mary Wanless", Robert Marshall's Instruction Room mural, Michael Albrechtsen's "First Vision from Afar", the stained glass depiction of Christ, and the temple is filled with Columbines. The main job of the contractor was to make sure the new Temple is as consistent with the 1890’s as possible. The new Temple features the “Holiness to the Lord, the House of the Lord,” a phrase that is prominently visible on most LDS Temples. The Tabernacle was the center for many Provo functions, concerts, LDS stake conferences, and other community events. Madame Abbie Carrington performed in the Tabernacle in 1891 and on September 1st, 1909, U.S. president William H. Taft visited Provo and spoke in the Tabernacle. 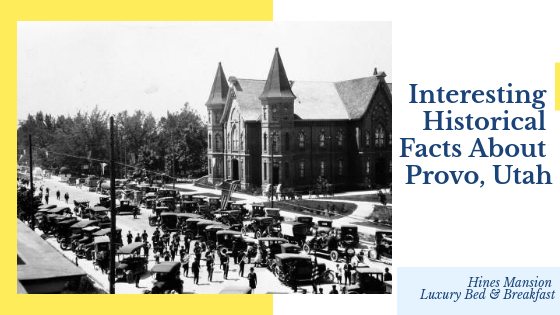 In the 1930’s, it was used for the first university lyceum programs. In 1938, the most famous lyceum occurred, and composer Sergei Rachmaninoff performed at the concerts. The temple has been used for prominent people’s life celebrations, hosting many funerals such as Hugh Nibley, Abraham O. Smoot, and Truman Madsen. In 1975, the building was marked in the U.S. National Register of Historic Places. Almost all pictures of the new Provo City Center Temple feature a sculpture in the north of the Temple grounds. The beautiful statue of a child walking with her mother to her father represents and embodies what Temples stand for, the Plan of Salvation, and why people are here on earth. This is why Jesus Christ came to Earth. It is a story of hope, love, and how families can be together for eternity. The Provo City Center Temple opened its doors to the public in 2016 and you can make a reservation to tour the Temple. 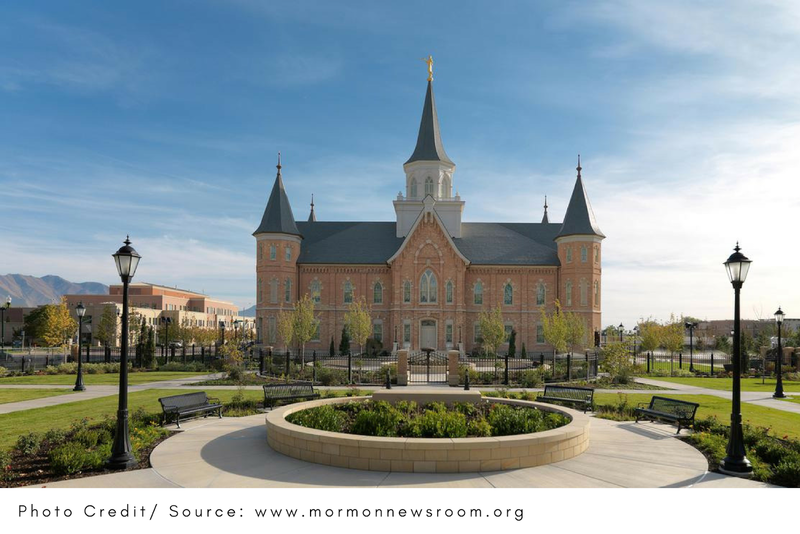 The Provo City Center Temple was dedicated on March 20, 2016, and became the 150th operating Temple of The Church of Jesus Christ of Latter-day Saints. During its dedication, Bishop Causee noted how people rejoiced as they needed their Temple back. Located in the heart of Provo City at the intersection of University Avenue and Center Street, it’s a place to go with the desire for peace and reflection. 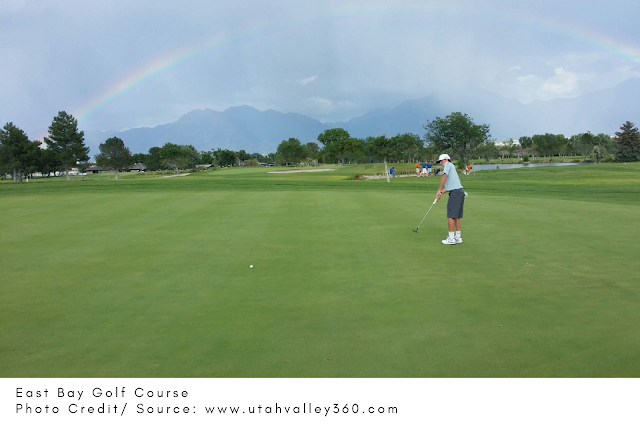 It’s fall again, and we all know that fall is the favorite season of Utah. The dark orange leaves, the yellow horizon, the whole atmosphere full of warmth and color. 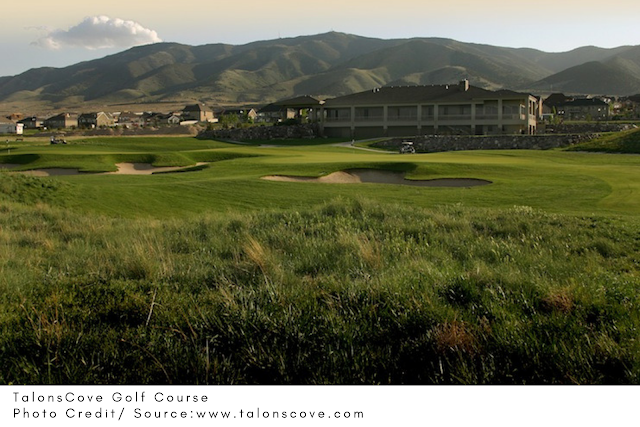 One cannot but bask in this seasonal splendor, especially when you take a look at the mountainside. 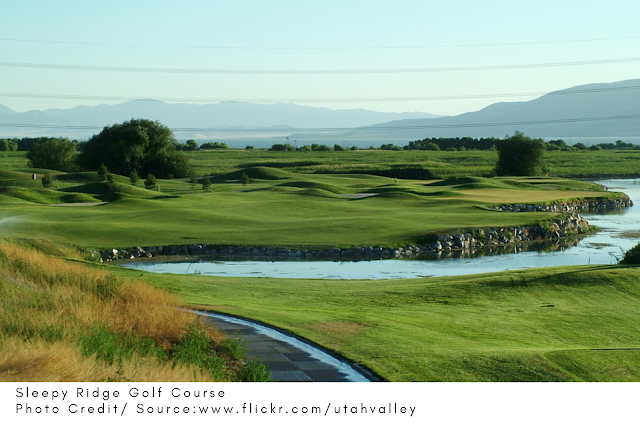 This builds a desire for more, and there is nothing more enjoyable than going for a hike along the trails of Utah. Hiking helps you appreciate nature as you hit the trail. You get to see the leaves fall slowly to the ground, the wind rustling through the fallen leaves, the beautiful picture nature paints each passing day; nothing beats it. Since you are searching for the best place to hike this fall, Utah has some that might become your favorite trails. 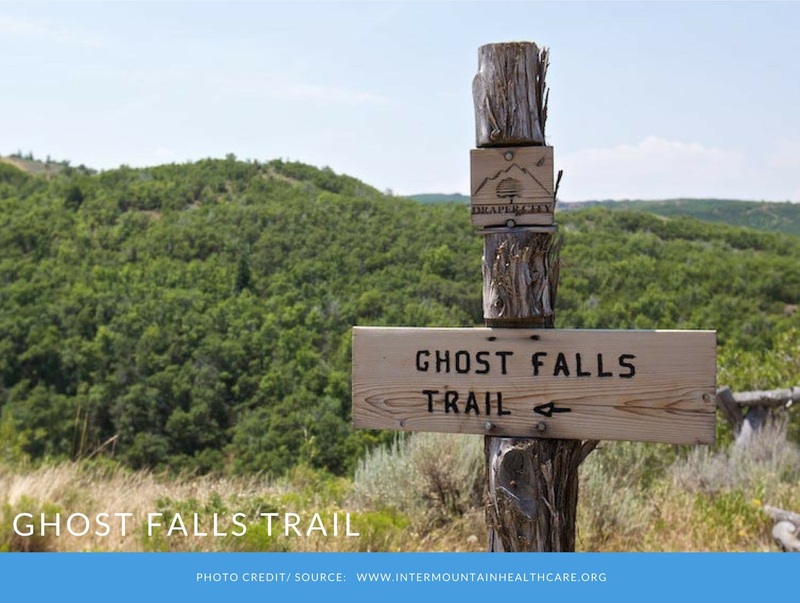 Let us start with 10 of the best fall hikes you can find in Utah this fall. Judging by the experiences of those that hike frequently, the Grotto Falls is the best trail to hike in Utah with either friends or family. It is a beautiful environment with a simple and fun trail. 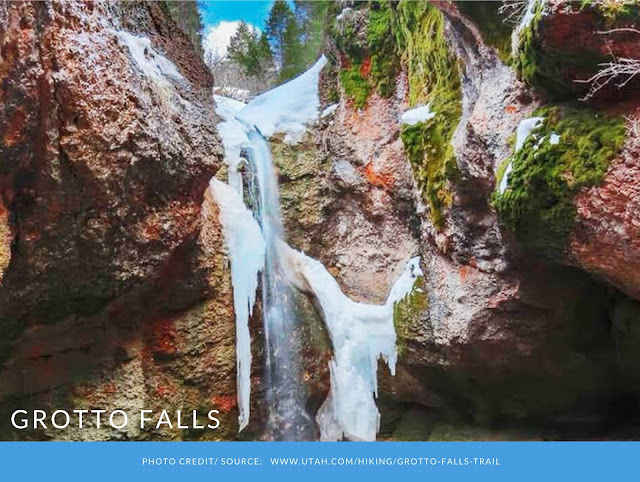 In case you have a hard time finding the Grotto Falls, it is located on the Nebo Loop. The scenic Nebo Loop is also a local’s favorite for fall drives. 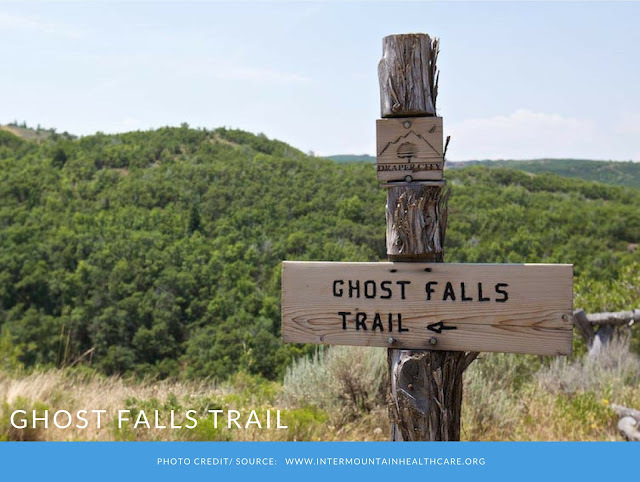 The Ghost Falls was given its name due to Halloween. Even if there’s no water running at the time, it is still a gorgeous trail. As you walk, you’ll notice the brightly-colored leaves popping their colors. What better way to show their beauty and keep you in awe than to show off their colors in the setting sun? The Ghost Fall is a cool place to hike. You should check it out! If you are scared of heights, then it’s time to get your freak on. Willow Heights has quite a steep climb to the top of the Willow Heights Lake but the trail is full of other distractions that you won’t even realize that you’ve gotten to the top. The trails are filled with aspens which turn golden yellow in fall. 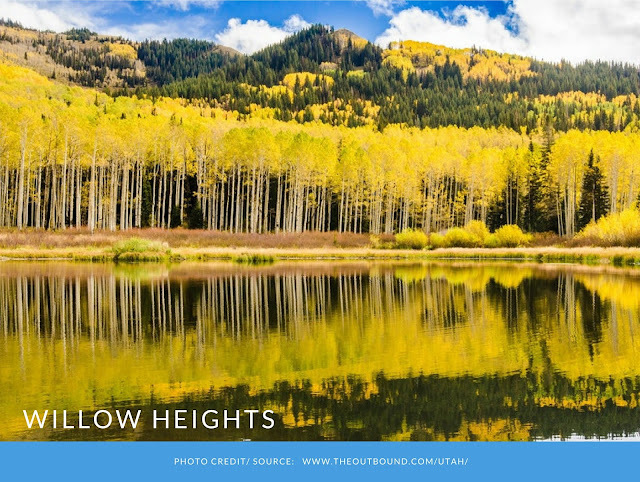 The small lake surrounded by aspens is truly a sight to behold. There’s good news and bad news. 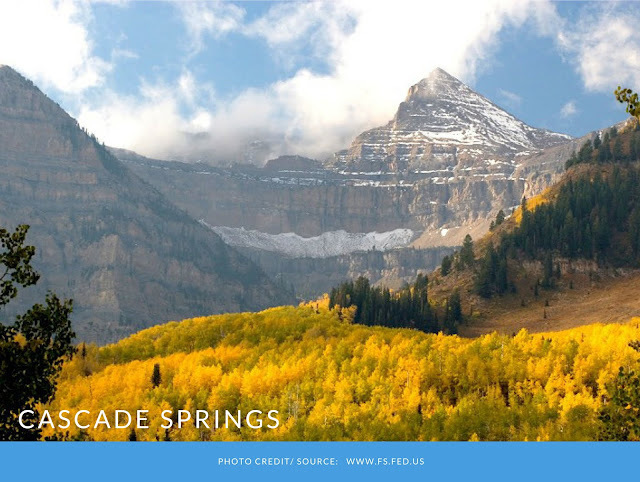 The bad news is that Cascade Springs is situated on the Alpine Loop, which requires a fee to gain entry. The good news is that the drive to the Springs is very beautiful. Getting to the waterfall is quite easy since the way is paved, or a boardwalk in some places. There are steep ups and down, making it an adventure you should look forward to; while considering the price. Get ready for an urban hike, as they call it. You still see the stoplights and the streets for the first 15 minutes into the hike. You can only find this uniqueness at the Bell Canyon Reservoir located in Sandy. You will love the colors and the beauty of the lake. A lot of hikers love this trail because it is not frequently traveled. For safety reasons, you are advised to travel this path as a group. However, the colors and beauty of this trail line its path as you proceed up the Gulch stairs. There are a lot of things to explore; you can either go down to the water or stay on the main trail. The Temple Quarry trail is very short and ideal for family trips. It is suitable for little kids and is stroller-friendly too. 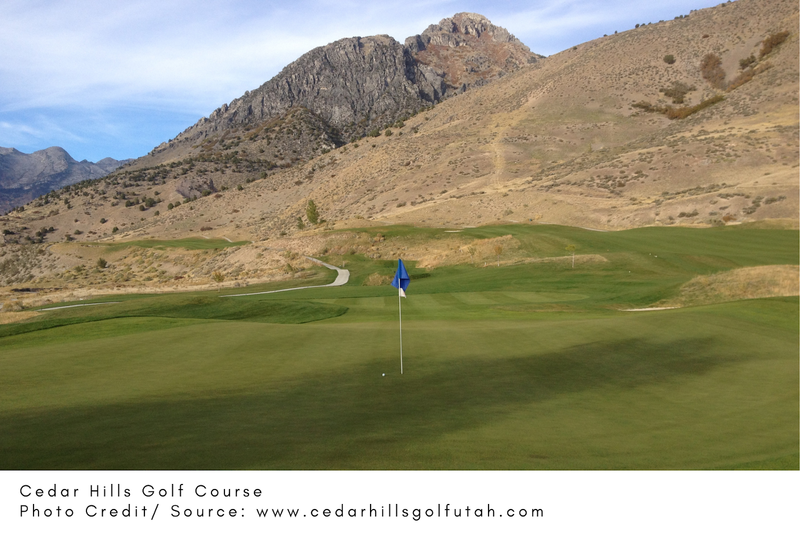 It is located at the mouth of the Little Cottonwood Canyon. Bring a camera with you because there are a lot of beautiful things to capture. 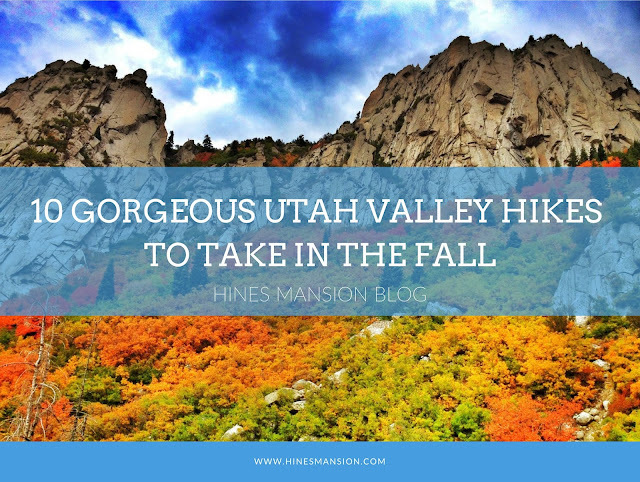 This is one of the coolest hikes you can embark on this fall. The sweet part about this Fall is that the waterfall makes a delightful splash during the summer. During the fall, the leaves leave a beautiful trail as you drive by the path. 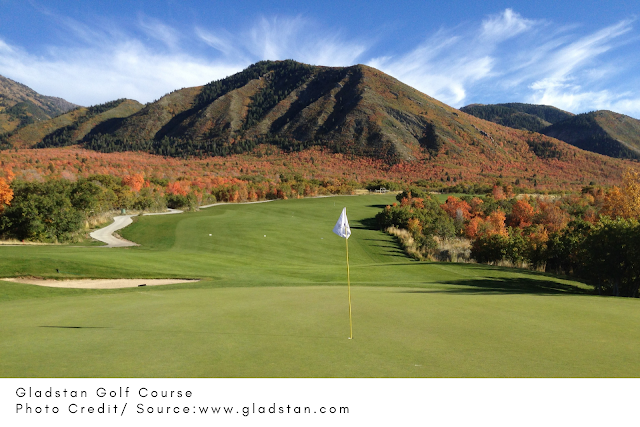 If you are looking for a place to enjoy the fall colors, then this is it. You get to see nature in its simplicity and splendor. There is a small waterfall filled with moss and covered on the surface with fallen leaves. The leaves begin to change color early in September, buying you enough time to see the beauty of the Falls in the fall. 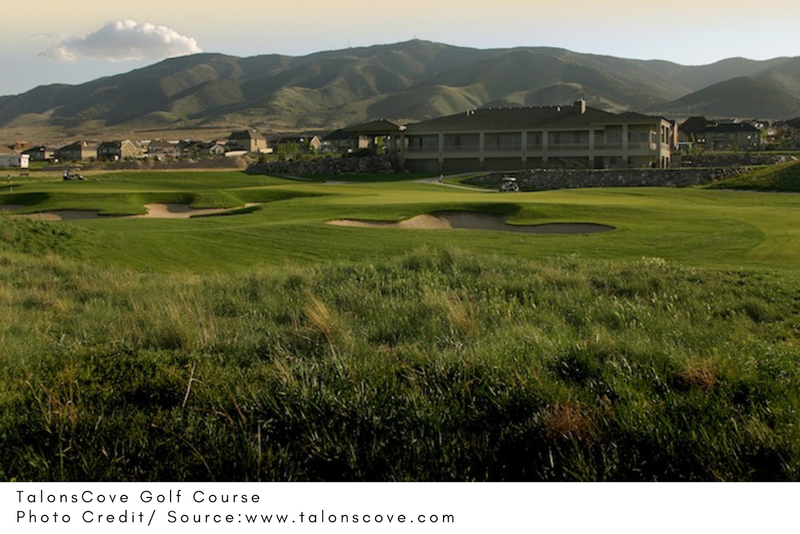 Driving along the Nebo Loop, you will see the Payson Lakes. It is fun and easy to walk around. There are paved paths that simplify the walks, and it is a stroller-friendly environment making it ideal for a family trip. Set up a picnic around the lake and enjoy the beautiful view! 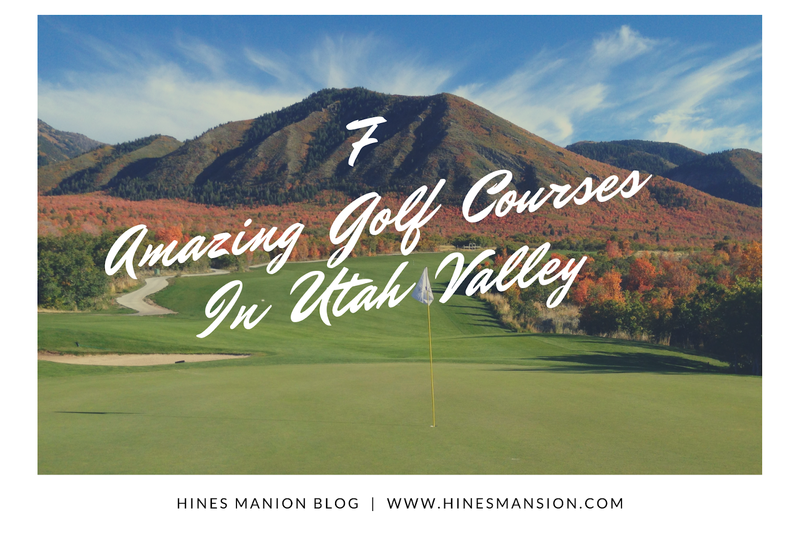 There are lots of trails to hike in Utah during the fall, these are just a few of our favorites. Many of them are stroller-friendly so you can bring the whole family. Always remember to bring plenty of water and snacks as well as a first aid kit. 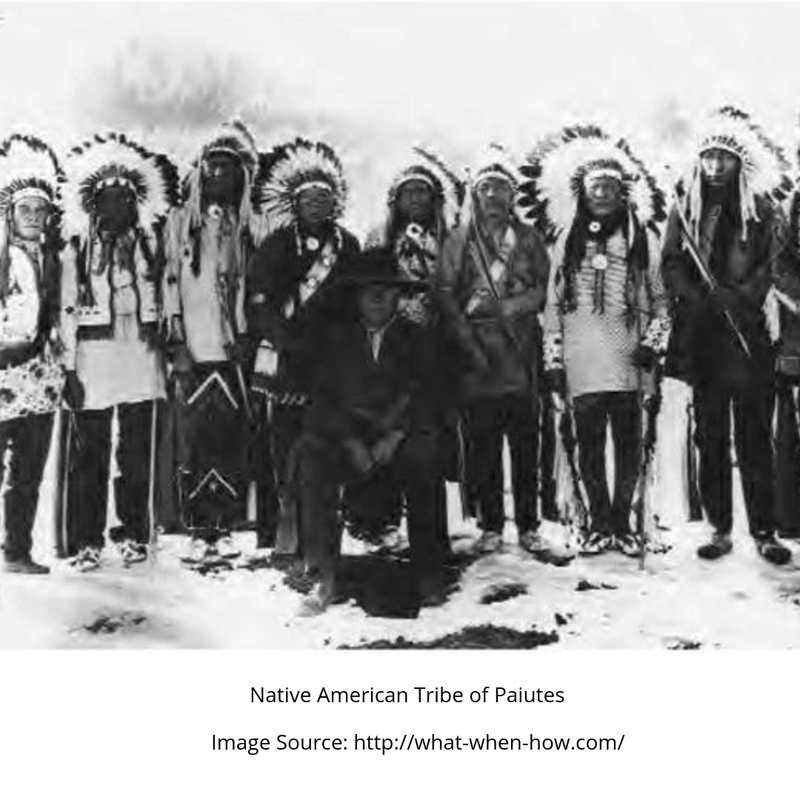 Not all of these hikes are very strenuous but they are sometimes in fairly remote locations.